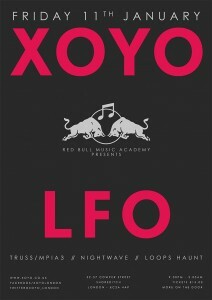 You are here: Home / reviews / Event Reviews / Jammy’s Jaunts: 11.01 – 12.01 – RBMA Presents LFO at XOYO and Mooch at Basing House. Plain and Simple’s roving reporter/man about town and clubbing addict Jammy brings you his eye view of the event he was partying at in the last week… This time he spent his jaunt at XOYO for LFO and Mooch at Basing House. Hello and welcome to Jammy’s Jaunts! Your weekly clubbing review of London! Happy New Year everyone! I trust you all had a great time whatever you got up to and at whatever party you were at, celebrating the New Year! I’m back after a break with the Jaunts and I hope you all enjoyed the ones I wrote last year and especially the review of the year that I published at the end of 2012. So to kick start 2013 I started off my first main jaunt on Friday at XOYO in Shoreditch for the RBMA presents LFO full live show alongside Truss, Nightwave and Loops Haunt. It was nice being back at Xoyo after so long and the place has recently had a pretty good renovation. The top part of the club has stayed the same, but as you descend downstairs, there is no bar in front of you like before, the bar is now on the right hand side of the club under blue moody lighting. In my opinion this works really well, with guys toilets on the right side of the room, while the ladies on the opposite side of the dancefloor. So anyway as I got to the place, someone called Nightwave was playing and by around midnight, the place was absolutely rammed. I literally had to push past and struggle through the crowd to get to a decent spot. 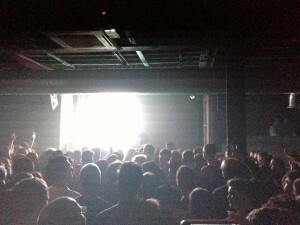 Truss was on from 1am – 2am and LFO (live) from 2am – 3am, so relatively an early finish for a Friday night. Soon the time for Truss to start playing was nearly up and the vibe and atmosphere in the place was really something! Last year I was really fortunate seeing Truss play and as his alias of MPIA3 and this time around he really didn’t let up! Straight from the word go, he began to smash the Xoyo place to pieces. Thunderous techno sending the crowd mental, so many sweaty people there it was unreal! It was quite a mixed crowd in there too and I’m sure a lot were out for the live set of LFO. As Truss made the whole place vibrate, It was nice to stand at the back where the raised dancefloor was similar to Fabric room 1 but on a much smaller scale. The place had a real underground feel and it was really carrying the sound well. As Truss’s set descended into techno chaos, the more edgy MPIA3 sound began to surface and I’m pretty sure the last 20 minutes were all MPIA3 tracks and it made for an incredible ending and a perfect warmup for the live show of LFO. As LFO started, his light show was spectacular! Illuminating the club with intense light he sent the Xoyo crowd into rapture. The crowd by then had all come downstairs to see him play and there was hardly any room to move. I had to stand at the back on the raised stage to fully appreciate the sound and light. I recorded some cool video of LFO play LFO (Warehouse Mix) and if you check on my page or the jaunts page on facebook, it should be there. That really went off when he dropped that, the crowd went mental and it was a true spectacle to see that. As you could imagine there were loads of people out with their phone cameras recording parts of the live set and more and more this is becoming more popular to do on nights out! What did we do before we all had camera phones back in the day eh? Still, it was a good Friday jaunt at a newly refurbished Xoyo. I definitely recommend visiting this place for a decent night out. The next jaunt on Saturday was at Basing House at a party called Mooch run by Natalie Coleman and Ed Jones. This party has been around since 2009 and has focussed their nights and efforts on bringing the best artists in underground House and Techno to London. They have also recently launched their own label: Mooch Recordings in Autumn last year. Recent artists that have played for them include: tINI, Tim Xavier, Chris Finke, Okain, Audiojack, and many more. 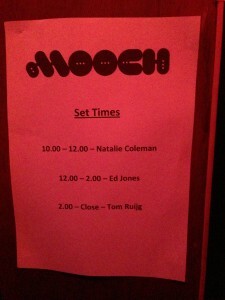 Saturday night was the 4th Birthday of Mooch with Tom Ruijg headlining alongside residents Natalie Coleman and Ed Jones. I got there around midnight and Basing House was still beginning to fill up. It was my first Mooch last week and I’ve always said I would check out this cool little party and the vibe was really good throughout the whole night. By 1am the place started to fill up and in the end the place was rammed. It took a while to build up but in the end I was certainly impressed with the crowd.